Why Is DfID Pushing Solar-Only When Africans Say They Want On-Grid Electricity? Yesterday the UK government formally launched its much-awaited Energy Africa campaign, which aims to accelerate electricity access for rural Africans. In a surprise move, DfID’s new plans include only support for small-scale solar power solutions. Typically these systems provide just enough power for a LED light bulb or two and a cellphone charger (see here and here for a few DfID favorites). That is hardly transformational access. Granted, it could have an incremental impact at the household level. A little electricity is better than none. And replacing expensive and polluting diesel generators with clean power is a good thing. Beyond this, however, DfID seems to have been captured by the environmental NGOs’ narrative about leapfrogging over traditional energy systems and meeting the need for transformational energy access with renewable off-grid solutions. The reality is that most people want access to “real electricity” that can at least power appliances like televisions, fans, radios, and perhaps even a small business. By that, they usually mean a reliable and affordable connection to the national grid. (2) Increasing financial support for the household solar market, including through the Africa Enterprise Challenge Fund. So, what would targeted beneficiaries think about this new campaign? A recent CGD energy access survey of over 2,000 Tanzanians – the country that supposedly inspired Energy Africa – may give us a clue (see methodological note below). This survey was broken into two branches – those with a grid connection and those without one. For those with a grid connection, we asked about things like electricity usage patterns, frequency of power outages, and satisfaction with service quality. For those without a grid connection, we asked a different series of questions. Such as whether they rely on a generator, have access to other energy sources like solar power, and whether they want a connection to the national grid. The results are very striking, and likely instructive for actors like DfID. Especially when it comes to those who “have access to electricity outside of the national grid, such as solar power, that is not provided by a generator.” Amongst this group of respondents (N=378), nearly half still want a national grid connection “very much”. Another 40% want a connection “a little”. Taken together, roughly 90% of them want a grid connection even though they already have access to alternative sources of electricity. 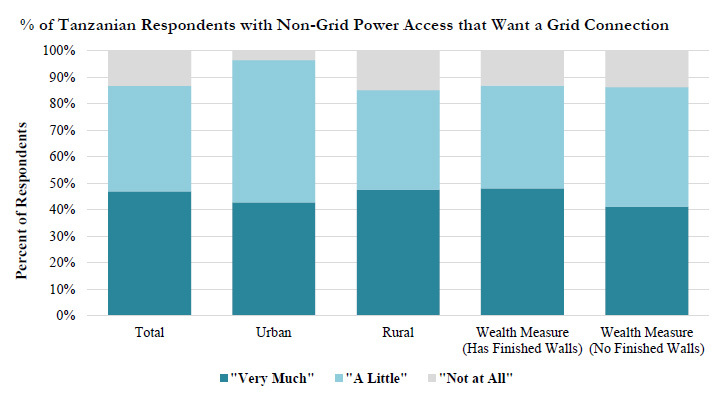 We find even more striking results in Ghana, where roughly 70% of these types of respondents want a grid connection “very much”. Now, we don’t know whether these people are accessing the types of household solar solutions that DfID plans to support. Nonetheless, the response rates are very, very high. If nearly everyone wants grid-based power, then what is stopping them? Roughly one-third of surveyed Tanzanians, and one-quarter of Ghanaians, do state that the grid is too far away. However, most of the remaining Tanzanians raise a different challenge – such as usage costs, connection fees, or utility delays. Why wouldn’t DfID focus on solving these problems while simultaneously pushing household solar as a stopgap measure for those who want it? In your view, what is the greatest obstacle to your household having such a connection? I honestly expected more from a premier development agency like DfID. Yes, there is pressure ahead of the Paris Summit next month. And yes, environmental groups are strong in the UK. But so is the development expertise and capacity of DfID staff. They know that there are no silver bullets for big development challenges. And the leapfrogging narrative just does not match the reality on the ground – both in terms of what people really want as well as how to get there. Yes, solar-based power systems can be an important part of the broader solution; they just can’t be the solution, even for most rural Africans without existing grid access. Now, there is a constructive way forward. DfID could build upon Energy Africa and announce plans to support a range of other power generation, transmission, and distribution solutions. This could even simply mean seamlessly incorporating the new campaign into DfID’s existing energy programs in the region. While far from perfect, President Obama’s Power Africa initiative could provide a blueprint. Namely, how its ‘Beyond the Grid’ program and solar investments are just one component of a broader sector-wide approach across the continent. **Methodological Note – The referenced survey was conducted between 26 June and 2 July 2015. The sample includes 2,046 phone owning Tanzanians over the age of 15, which were randomly selected and interviewed in Swahili and English. The survey used interactive voice recognition and random digit dialing (RDD) techniques. The sample was compared and weighted to known population parameters, which suggest an estimated sample error of +/- 5.74 percent. The full results will be released alongside a CGD analytical product.